Roofwise UK Ltd are your local and professional Leicester based roofing contractors. Our trusted and experienced team specialise in commercial and residential roofing. Proudly offering great prices with an excellent and prompt service. 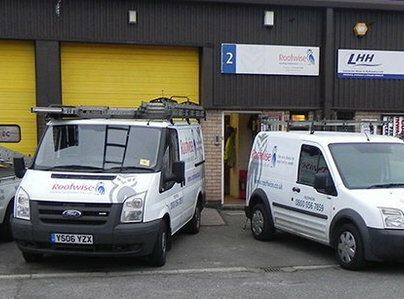 Roofwise Uk Ltd is a long established, leading, commercial and residential, professional roofing company situated conveniently in the heart of Leicester with an outstanding reputation. With over 40 years experience of specialising in all aspects of the industry, we are fully approved and trusted contractors for local authorities, working closely with Leicester City, Leicestershire County and Derbyshire County Councils over many years. During the storm just before Christmas water was dripping into my lounge from the light fitting. Next day I looked to find out how it had got in. There were no obvious places. I called on Roofwise who sent Darren. He saw that some of the ridge tiles were loose and a split in the flashing. A few days later his quotation arrived. I rang on Monday morning with one or two queries and agreed Roofwise should carry out the work. They came Monday afternoon, took off all the ridge tile, cleaned and replace them, replaced a broken one with one they happened to have in the van, repaired the flashing and cleaned up the debris. The work was done well by a very polite and respectful team. Likewise the office staff proved polite and willing to please. All this work was done at a time which suited me. I am very impressed on every count. A good job done at a fair price. After some bad experiences with shoddy builders and roofers, I finally across Roofwise. They did a great job and the lads they sent were awesome. They used quality products and gave a good price for the quality, got the job done good and quick, well worth the money and will be using them again for part 2. Experiencing intermittent leaking roof. Roofwise were quick to be on site after initial enquiry. An examination revealed likely sources of the problem with photos taken to show and to verify diagnosis - which was very helpful. Comprehensive, professional, paperwork with a competitive quote was received very quickly and a mutually agreed time was fixed for the job to be done. Indeed, as an afterthought I asked if a stretch of guttering could be done while on site. This extra work was met with ready agreement - and at no extra charge. Communications between Roofwise and myself were excellent. The work was carried out extremely efficiently by two very pleasant chaps, showing competence, care and consideration. I can recommend Roofwise without hesitation or reservation. I, personally, will not consider anyone else for roof-related work in the future . Brilliant people from the lady in the office to the guys that do the work. They replaced my pitched roof and my flat roofs. They worked hard and I am very pleased with the results. I would recommend Roofwise to my friends and family. I could not fault the firm that did the work for me. They came on time and just got on with the job. I would certainly recommend Roof wise to anyone who is looking for roofing to be done. I hold my glass up to you and say cheers and good luck for the future. Shoddy work, disappointed. Now in dispute, cannot rely on Which? recommendations. We're sorry to hear your comments. We'd love to find out more about your experience and where we went wrong. 99% of our customers rate us very highly - this is something we are extremely proud of. Again we are sorry and would appreciate some additional feedback and a chance to rectify any issues. We have used Roofwise for a number of jobs on our church roof, including ridge tiles and replacing half an elderly roof with Victorian skylights. On every occasion, professional and reliable. We never look anywhere else. Most impressed with the standard of workmanship. The workmen were pleasant and polite, and worked diligently, and efficiently throughout the day. All mess was cleaned up before leaving. Altogether a first class job. What a fantastic company to deal with. We had our complete roof over clad and from start to finish our job was dealt with quickly and very professionally. They were very well organised and very easy to deal with, the quote was done quickly and all the guys were great to deal with, very polite, a real credit to the company. I would have no hesitation to recommend them. I will be using them again to reclad the back of my factory in the near future. And the price was good too!!! Superb!